The first hull of the Princess 30M Class, Kohuba, has been delivered. Kohuba can house a 4.5 metre tender. Princess Yachts has delivered the first hull of its new M Class, the 30.45 metre Princess 30M, and is named Kohuba. 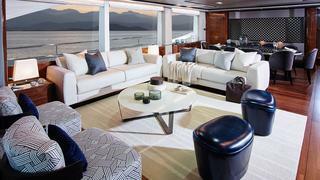 The semi-custom yacht was on display at the Dusseldorf Boat Show in January. 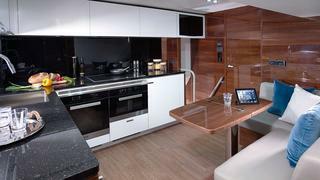 Designed by Olesinski, the Princess 30's exterior boasts the sleek, modern lines characteristic of the M Class range. Built in resin infused composite, she is expected to reach speeds of around 27 knots. Her impressive flybridge features flexible modular seating, a full wetbar and a hardtop with a sunroof. 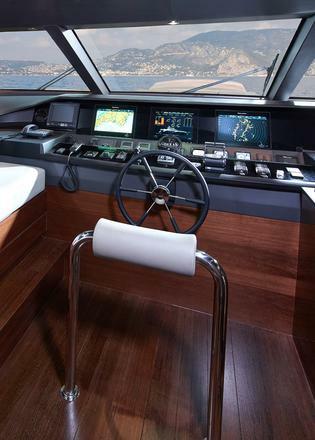 The aft cockpit includes a large comfortable seating area, wetbar and shaded flybridge overhang. Twin transom gates lead to a hydraulic swimming platform and a garage that accommodates a 4.5 metre tender. The Princess 30M is equipped with twin MTU 2000’s as well as a full hydraulic system powering her thrusters. She also has stabilisers, a comprehensive control and monitoring system, and twin anchor winches. The interior of Kohuba is designed by the Princess Design Studio and the owner. 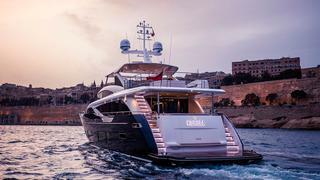 Despite being the smallest in the M Class range, the 30M has an expansive and luxurious interior designed by the Princess Design Studio in consultation with the owner. She houses a main deck master suite with a reverse cabin layout and four double guest cabins, all with en suite bathroom facilities finished in marble or granite. The saloon features wide sliding doors that open to a folding side balcony. 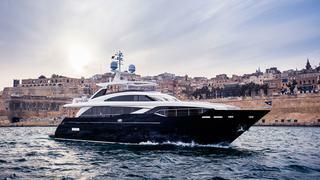 This new 30 metre superyacht is the latest addition to the British yacht builder’s semi-custom M Class range. The first Princess 35M, Antheya III, debuted in September 2015 at the Cannes boat show. Imperial Princess, the first hull in the range's Princess 40M flagship model, was launched in 2012.